I reviewed the US version of this 7" on Swami a few days ago, but there is another version of this single release by La Castanya in Spain. 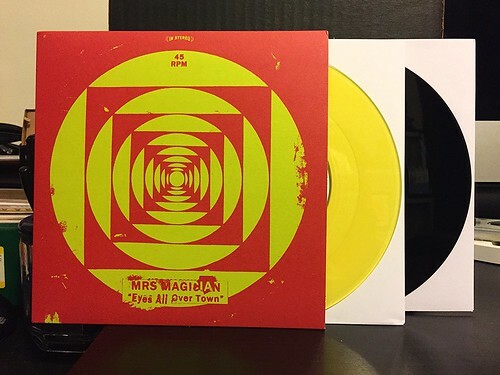 In addition to a different color scheme for the artwork and the fact that it's available on yellow vinyl, this 7" is sporting a completely different B side than the American version. That B side what I'll focus on for the purpose of this review. "Do You Wanna Walk Around In The Dark" has a slightly odd 80's sound to it. It's the sort of song you could probably imagine in the context of a John Hughes movie when the main characters are having a heart to heart moment and are realizing they've been right for each other all along. Despite my general dislike of most 80's music, Do You Wanna Walk Around In The Dark" doesn't bug me as much as I would think it could if you were just telling me about it. Luckily, Mrs. Magician picked one of the only decent 80's vibes to be influenced by as the "Don't Fear The Reaper" guitar tone keeps the song rooted and prevents it from drifting into cheesy novelty territory. I certainly prefer when Mrs. Magician is blasting out louder, fuzzier surf tinged pop songs, but "Do You Wanna Walk Around In The Dark" is a fun little B side. If Mrs. Magician made a whole record like this, I'm not sure I'd be on board, but it's totally fine as a one off.